These organic sprinkles are just made from just two ingredients – shredded coconut and fruit or vegetable juice. 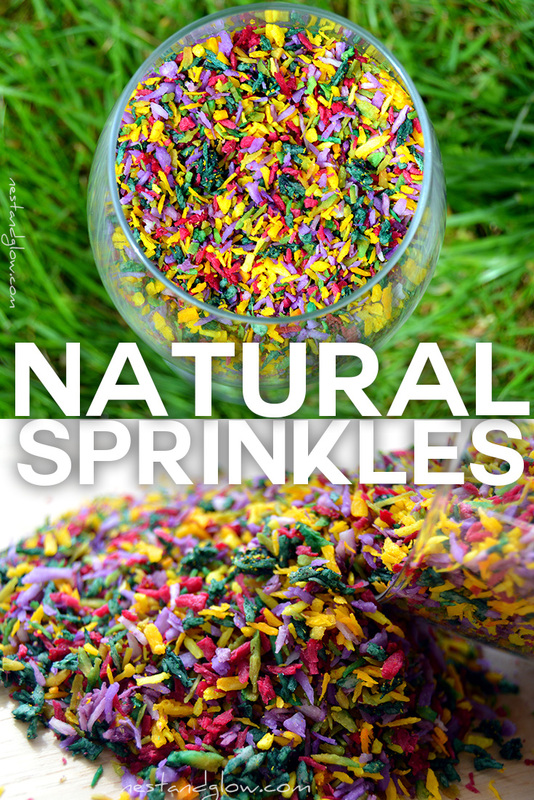 It really is that easy to make colourful natural sprinkles without any e numbers, artificial chemicals or other nasties. They do not use any colouring from bottles and are sugar-free. Some food colourings are called natural but the colouring may not actually be that healthy as chemical processes are still involved. By just using fruit juice, veg juice and spices you can ensure the sprinkles are healthy, and it’s a lot cheaper than buying food colouring. It’s more fun also, as you’re not sure what colour you will end up with – see the red cabbage with baking soda. I’ve tried a variety out below and made several different greens, purples and oranges. So depending on what you have available you should be able to make a rainbow of colours. If you only want to buy one vegetable to do the colouring I would suggest red cabbage as it makes purple and with a bit of baking soda also makes blue that drys green and yellow shades. The natural sprinkles have a very mild, but pleasant taste and the coconut is nice and crispy after being dried. Much tastier than the chemical cocktail of traditional sprinkles. Mix about 2 tablespoons of fruit/veg juice with 1/2 cup / 30 g of shredded coconut. I use unsweetened coconut but I’m sure it would work with sweetened if you prefer. If you’re using a powder such as wheatgrass or turmeric mix 1/2 tsp with 2 tbsp of water. Once the coconut is dyed spread out over a non-stick sheet. Then place in an oven on a very low heat, preferably less than 100°C, with the door open a jar. They should be dry in 50-60 mins depending on the temperature, but check them every 5 mins to make sure they don’t burn. Toss while drying to speed it up. If you have a food dehydrator, put them in at 40 °C / 100 °F and they should be dry in 4-6 hours. Store in an airtight container somewhere dark and they will be good for a few months. However it’s better to use them sooner rather than later as the colour and flavour will fade. You can use 2 tbsp of water with 1/2 tsp of spirulina to make a dark green colour. Using dried wheatgrass to the same proportions gives a light, and unsurprisingly, grass green colour. If you juice red cabbage and add 1/4 tsp baking powder for 2 tbsp of red cabbage juice you will get a bright blue colour. If you’re doing something fresh where wet sprinkles are fine you could use these blue sprinkles. However if you want them dried then they will turn a greenly and yellow colour, see below. Both carrot juice and turmeric sprinkles end up a similar colour when dried so do whatever one you fancy. Juice some carrots and mix with the shredded coconut to make orange sprinkles but once they are dried they turn more of a yellow orange colour. If you don’t have a juicer see how to juice without a juicer. Mix 1/2 a teaspoon of turmeric with 2 tablespoons of water to make the turmeric dye. This doesn’t make the sprinkles taste of turmeric as you only taste a tiny amount at a time. Both of these end up the same colour when dried, but the blackberry one’s taste slightly better. Juice some red cabbage for the purple dye, or blend and then push through a sieve. For a berry purple you can use any dark berries such as blackcurrants, blackberries or blueberries and simply push thru a sieve to get the liquid to dye the coconut. No surprises here that beetroot is used for a natural red colour. You can either boil diced beetroot in water for 5 mins or just use the juice from vacuum packed beetroot (without vinegar) to make the red sprinkles. That’s all the colours and combinations we’ve made so far. Mix together to make a natural vibrant sprinkle mix. Different desserts call for different coloured sprinkles – we used three different greens on top of a chocolate mint cake. Have you made any different colours? Let us know in the comments or on social media. These sprinkles go great in all recipes just like my cashew vanilla fudge. Oh no that’s a real shame – did you bake or dehydrate? The colours in my photos / video are all real (was before I even worked out how to do colour correction!). They have a very mild taste I find and I quite like it as you only have a tiny bit per serving and everyone I’ve given them do couldn’t taste what they were unless they knew.